Director: Graeme Clifford. 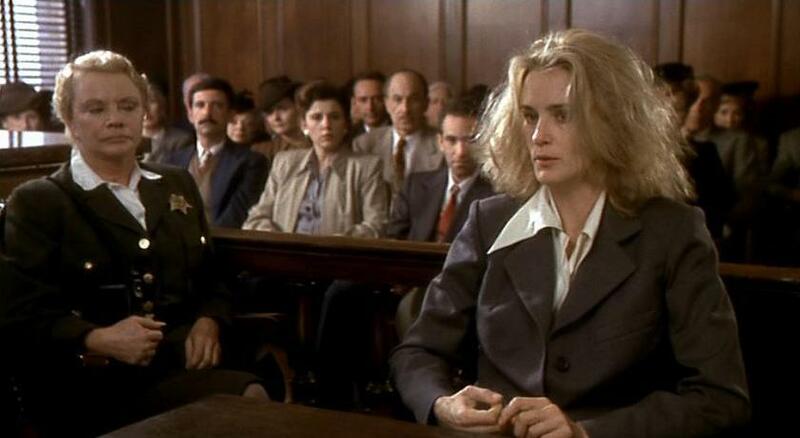 Cast: Jessica Lange, Sam Shepard, Kim Stanley, Bart Burns, Jeffrey DeMunn, Allan Rich, Lane Smith, Christopher Pennock, James Brodhead, Bonnie Bartlett, Rod Colbin, Jonathan Banks, Biff Yeager, Vincent Lucchesi, James Karen, Gerald S. O'Laughlin, Donald Craig. Screenplay: Eric Bergren, Christopher Devore, and Nicholas Kazan. Twitter Capsule: Just because I've built a life around it and Lange is Herculean doesn't mean I can't see its problems with structure, etc. VOR: ③ Sometimes stretches biopic format to exciting, ragged extremes; sometimes just bungles it. Profiles of the artist in extremis aren't rare but ones this harrowing and female-driven are. There are two possible lessons to take away from Graeme Clifford's Frances, the horrifying but wholly uneven biography of Frances Farmer, a promising young star of the 1930s. Frances' intelligence, political affinities, and burgeoning ambition in all areas of her life meant that no onenot Hollywood, not her doctors, not her familyknew what to do with her. The "two" lessons we may take from Clifford's telling of her tale are essentially flip-sides of one another, and may be thought of along the glass half-full/half-empty lines. You either finish the movie woeful that one terrific performance cannot salvage a disorganized picture, or finish it marvelling how an actor could pull such towering work out of a script that gives her so little raw material. Jessica Lange's embodiment of Frances is so blistering, but also so carefully gauged and so unexpectedly, darkly funny (only at times, to be sure) that I choose the latter interpretation. Besides, the film has endured for over 15 years as a popular rentalnot an eon, to be sure, but unthinkable if associated with any other component of this otherwise stunningly mediocre work. Lange is wonderful, and provides a searing, tremendous reason to see a film that would otherwise collapse under a moment of analytical pressure. Exactly how renowned was Frances Farmer to contemporary audiences, and how aware were they of her ideas and her background before Hollywood caved in on her? What happened in the life of her mother, played by Kim Stanley as a gargoyle who occasionally impersonates a woman, that she becomes so predatorially complicit in the studios' and the hospitals' assault on her daughter? How does Frances manage to escape one mental institution merely by dashing across the grounds and jumping a wall with Sam Shepard's assistanceparticularly when the governing condition not just of that hospital but of Frances' entire life was that she was ever and ever more bounded in? And even if that last instance may be explained by her quick recommittal to another institution, why does she keep returning to the dragon-like mother who over and over sentences Frances to doom. "I just can't give up on her," Frances confesses to Shepard's enamored journalist, and Lange makes us feel an illogical, daughterly emotion and an awareness of her own masochism that the actress alone, not her deficient script, makes clear to the bewildered viewer. Indeed, the major supporting performers are all fairly capable, and several moments of Frances have their own virtues. An introductory sequence centered around Frances' high school essay on the Nietzschean death of God is particularly striking, as are her bemused and unruly battles of will with different doctors, judges, and police officers. Still, Frances lives and dies by the efforts of Jessica Lange, who made her career upon the nearly simultaneous release of this punishing drama and the couldn't-be-more-different Tootsie. She plays Frances at every stage from high school to her post-lobotomy, zonked-out appearance on Ralph Edwards' This Is Your Life, and utterly convinces us at every age and stage. She gleams whenever Frances smiles, but then goes utterly to tatters without any obvious frumping-down, eventually tapping a rage more naked and electric than anything I have seen any actor, male or female, achieve in any motion picture that comes quickly to mind. And forgive another moment of what seems like hyperboleI vow that I mean these statements quite sincerelybut the instant when Frances finally accuses her mother of facilitating the collapse of her mind and spirit is another peerless moment of movie acting. There is nothing actressy about Lange's delivery of these horrible words, but we believe that even Mrs. Farmer, so utterly insensitive to her daughter's cries for help, feels the brunt of this final condemnation.